Single-ply roofing is used extensively by McDonald & Wetle in the Pacific Northwest on flat and low-slope commercial buildings. This type of roofing material helps to prevent water damage in a damp climate. 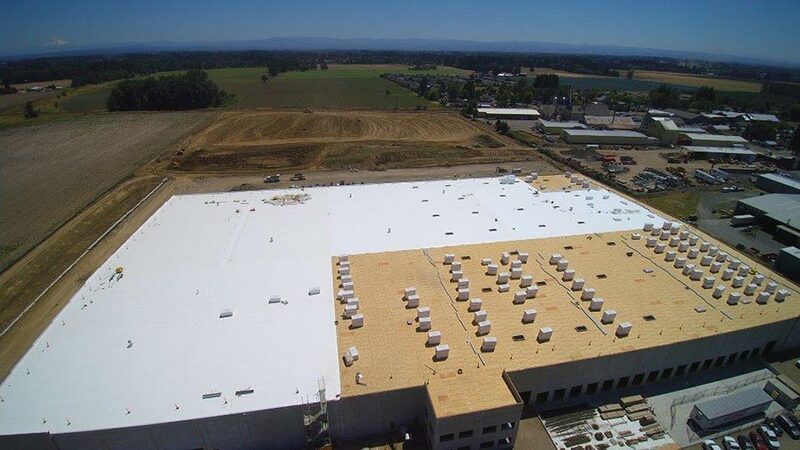 Single-ply membrane roofing is composed of sheets of flexible synthetic rubber or polymers applied in layers. Unlike shingles, single-ply Thermoset or Thermoplastic membranes are installed in long sheets with limited seams. 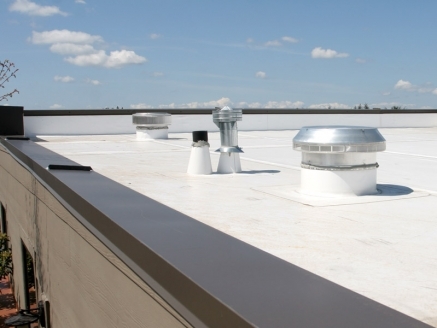 The smooth surface allows for easy rainwater and snow runoff with proper roof drainage on commercial and industrial buildings. The synthetic material is resistant to the hailstorms that occasionally hit the Pacific Northwest and will not support the growth of moss and algae. Debris from windstorms also is easily removed from single-ply roofs. Thermosets are composed of synthetic rubber polymers including EPDM (ethylene propylene diene monomer) or Neoprene. Thermoplastics are usually PVC (polyvinyl chloride) or TPO (thermoplastic olefin), synthetic plastics that are very flexible. They can be hot-air welded together so water will not penetrate. The sheets may have a layer of fiberglass for extra strength and stability. The single-ply sheets will fit tightly around all roof vents and drainage systems. 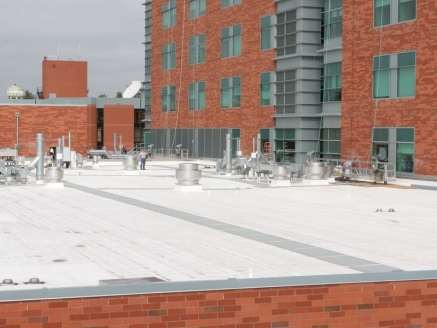 Single-ply roofing materials are usually applied over roof insulation products for energy efficiency. The white sheets can contain titanium dioxide to increase UV protection by reflecting sunlight during long summer days. 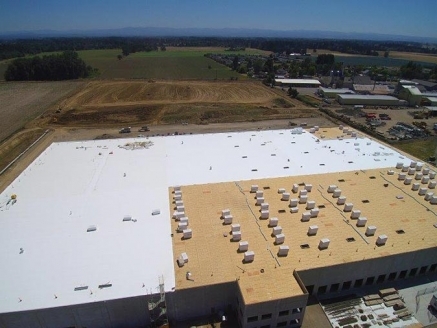 The single-ply sheets can be mechanically attached to the roof or an adhesive can be used. The decisions on which products to use are based on the type of underlayment and the slope of the roof. There are many products available from leading manufacturers of roofing materials. 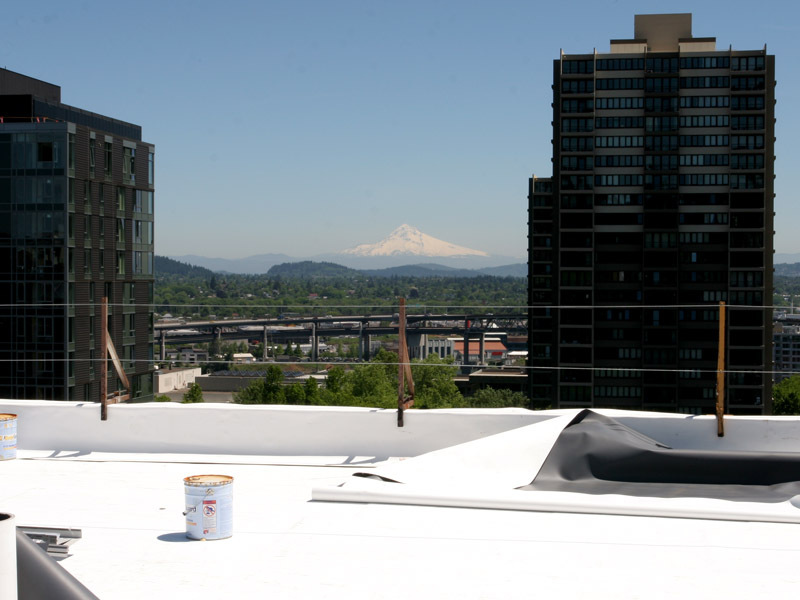 McDonald & Wetle technicians have installed single-ply roof materials on buildings throughout Oregon, Washington and other parts of the Northwest. The commercial buildings have included high-rise office complexes, shopping centers and apartment communities. 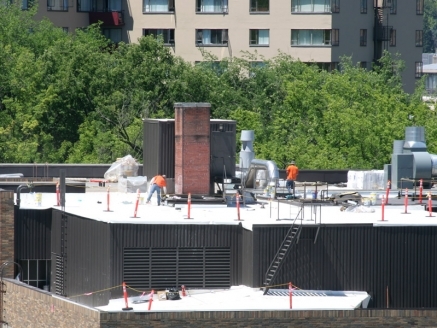 Contact McDonald & Wetle for information on using single-ply materials for your next commercial or industrial project. We will give you a reliable cost estimated on the best materials for your project.